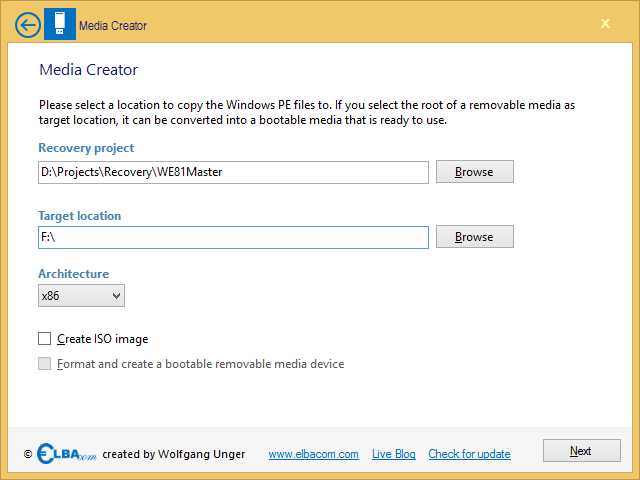 Media Creator allows you to create a recovery media out of your Recovery Creator projects. It suppors creating ISO files that can be burned to a DVD/CD or to create a bootable flash media. It also allows to put the Elbacom Embedded Toolkit to a new media (USB & DVD). Also it will automatically install all prequisits, such as the Windows Assessment and Deployment Kit. Media Creator will check if all required files are on the system. If not, it will download and install the Windows Assessment and Deployment Kit (ADK) automatically. Media Creator can create bootable ISO images, that can be burned to a DVD or CD. If the output target is a removable USB media, Media Creator can make it bootable. This way you can use the USB device to boot directly on your target device. Media Creator will convert recovery projects, that have been created with Recovery Creator into a bootable media. 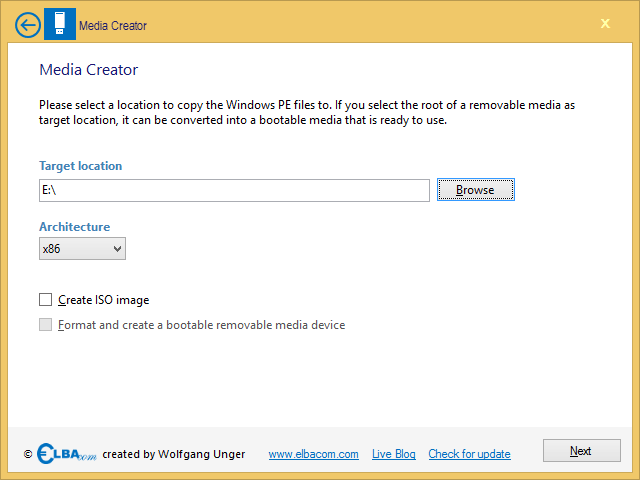 Media Creator allows to create a copy of the Elbacom Embedded Toolkit on another media. For example DVD or USB. Media Creator should be started on your development machine. It is a wizard that allows you to create a new recovery media or toolkit copy with a few clicks. 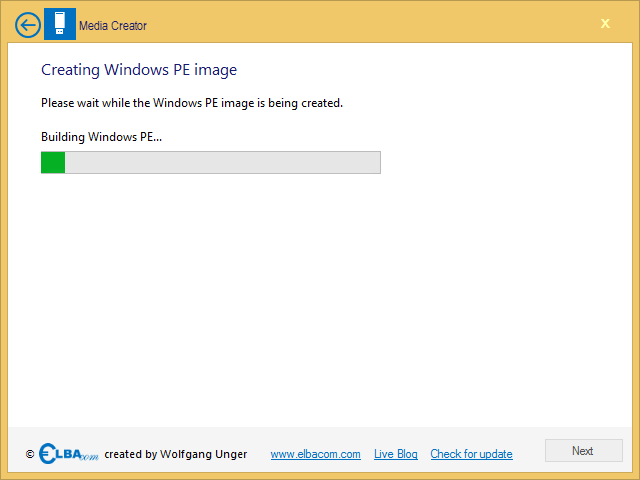 Media Creator requires the Windows Assessment and Deployment Kit (ADK) to create Windows PE images. Windows PE is requires, as it is a small and light-weight operating system, that can boot from USB and DVDs. It is also the host system for the Elbacom Embedded Toolkit and your recovery projects. 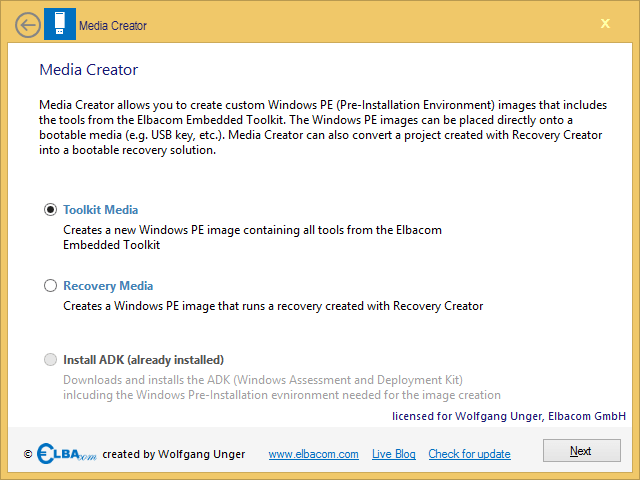 To install the ADK on your development machine, just start the Media Creator from the Elbacom Embedded Toolkit. It will recognize if the correct version of the ADK has been installed on your pc. If not it will only allow the option “Install ADK” to be selected. If it is grayed out, the ADK has already been installed. If not, click “Next”. 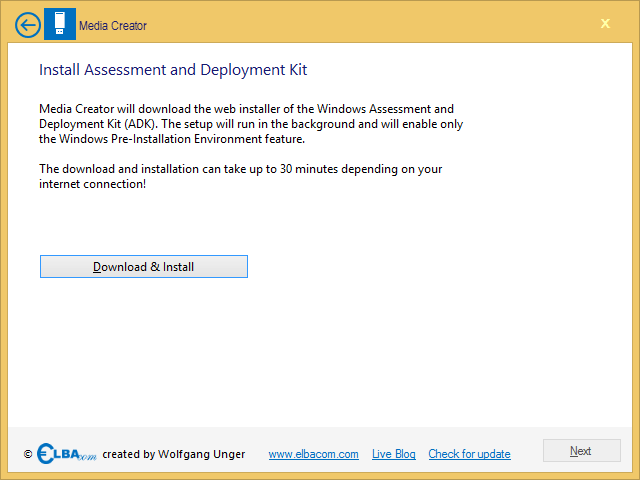 Media Creator will automatically download the web installer and only install the Windows PE feature. Click on “Download & Install” to start the process. Please wait for it to finish. Depending on your internet connection, the process can take up to 30 minutes. Select “Toolkit Media” and click “Next”. Specify the output location. This can either be a folder on your pc or you can select a removable media, such as a USB drive. If you have selected a removable media, the Media Creator will allow you to check the “Format and create bootable removable media device” option. If you choose this option, your removable media will get reformatted and will be prepared to boot the Elbacom Embedded Toolkit. Select the architecture of the operating system. It is important to choose x86 for 32-Bit installations or if you would like to install a 32-Bit operating system using Windows Online Configurator and amd64, if you would like to install a 64-Bit OS. Media Creator will then create the approperiate Windows PE version. If is required to select the correct architecure because Windows PE does not include the WOW64 support (Windows On Windows – to run 32-Bit applications on a 64-Bit system). Check “Create ISO image” if Media Creator should also create a bootable ISO file that can be burned to a DVD. Media Creator will now create your media. Select “Recovery Media” and click “Next”. Select your recovery project, that you have created with Recovery Creator. If you choose this option, your removable media will get reformatted and will be prepared to be bootable. Select the architecture of the operating system. 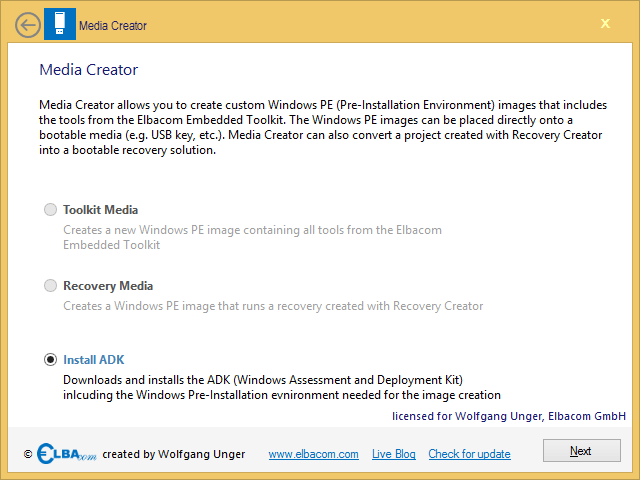 Media Creator will now build your recovery media.